Tories spur a marathon vote after their motion on PM’s India trip fails. Conservative Leader Andrew Scheer stands during question period in the House of Commons on Parliament Hill in Ottawa on Wednesday. 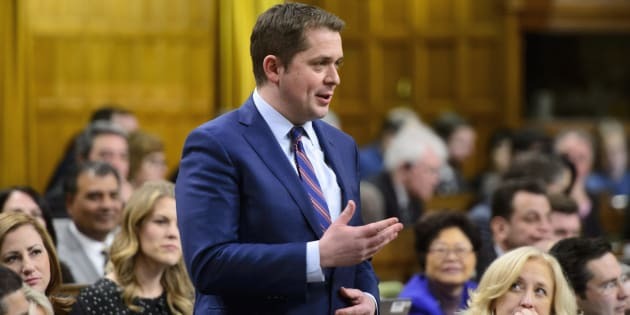 OTTAWA — As Conservative MPs hold the House of Commons hostage over a failed attempt to convince the Liberals to allow a top public servant to testify on the prime minister's disastrous trip to India, HuffPost Canada has learned the government offered to brief Tory Leader Andrew Scheer on the situation. Scheer's spokesman, however, said the Conservative leader is unaware of the offer. "You are being lied to," Jake Enwright told HuffPost Thursday. "This [is] fake news." "Has the government offered Andrew a briefing? The answer is 'no,'" he said. "PMO hasn't offered Andrew a briefing," the press attaché added, saying he would "find it very weird" if the bureaucrats had offered a briefing. But he pledged to continue looking through the leader's snail mail correspondence. When asked if Scheer would accept a briefing, Enwright stated: "I will not respond to hypothetical situations." Stéphane Shank, the manager of media relations at the Privy Council Office, told HuffPost in an email that "the Government of Canada did offer a briefing on India to Mr. Scheer." But Shank declined to say when or how the offer had been made and what, if any, response had been received. A government source said the offer had been made earlier Thursday. Scheer, as a former speaker of the House of Commons and party leader, is a member of the Privy Council and can have access to information not otherwise available to most MPs. The Conservatives and Liberals are currently locked in a Commons battle about the right of members of Parliament to hear from Prime Minister Justin Trudeau's national security adviser, Daniel Jean. Jean was the senior government official who told reporters that the presence of Jaspal Atwal, who has been convicted of attempted murder, at Canadian High Commission events in India had been arranged by factions within the Indian government. This despite the fact that British Columbia Liberal MP Randeep Sarai had taken responsibility for placing Atwal on the list of invitees. Upon Trudeau's return to Ottawa, opposition MPs demanded that Jean testify before a Commons committee but the majority Liberal members denied the request. Public Safety and Emergency Preparedness Minister Ralph Goodale stands during question period in the House of Commons on Parliament Hill in Ottawa on Thursday. Public Safety Minister Ralph Goodale told reporters that if MPs wanted to hear from Jean they should do so at the National Security and Intelligence Committee of Parliamentarians (NSICOP) where the national security adviser could offer a complete picture of the situation, including top-secret information, and explain his talk with reporters. NSICOP is a committee run out of the executive branch that includes Liberal, Conservative, NDP and Senate representatives who are sworn to secrecy and cannot publicly reveal any of its discussions. Conservative MP Tony Clement, the Tories' representative on the committee, told HuffPost he could not answer questions related to the national intelligence committee and whether Jean had testified. "I cannot confirm or deny agenda items," he wrote in an email. Independent Sen. Frances Lankin confirmed that none of the members would be able to answer any question with respect to NSICOP. The opposition is suggesting that the Liberal government is using Jean as a pawn to explain away an embarrassing situation. The prime minister needs to "come clean with the conspiracy theories he has been putting forward," Conservative MP John Barlow said. "This is an issue of concern for Canadians across the country who want to ensure that their prime minister is being honest, especially in his dealings with countries around the world like India, a trusted ally, one of the largest democracies in the world," Barlow added. Jaspal Atwal, right, arrives with his lawyer Rishi T. Gill for a news conference in downtown Vancouver on March 8, 2018. Liberal MP Mark Holland, the parliamentary secretary to the minister of public safety and emergency preparedness, retorted that the opposition was calling "into question the professionalism of some of our most senior public servants in the country." Thursday evening, Grit MPs defeated a carefully worded Tory motion, 161 to 111, calling on Jean to appear before the Commons committee on Public Safety and National Security to provide MPs the same briefing he gave to journalists on Feb. 23, 2018, and that the briefing take place in public and no later than March 30. All opposition MPs — but for one exception, former Liberal Hunter Tootoo — voted against the government. As a pressure tactic, the Conservatives pledged to call more than 200 confidence votes related to budgetary matters — meaning a marathon vote of some 40 hours for MPs. The Atwal/Jean matter, however, is not dead yet. Conservative MP Erin O'Toole has raised a question of privilege with the Speaker of the House of Commons alleging his rights as a member of Parliament to fulfill his duties unfettered have been breached. "Parliamentarians deserve the same ability to hear what Mr. Jean said to members of the press gallery," O'Toole told reporters Thursday. "We're going to show our lack of confidence through those votes, and that's how Parliament works. We're trying to just do our job." Geoff Regan, the Speaker of the House and a Nova Scotia Liberal MP, has yet to rule on the question of privilege.